HOT GRIPS PREMIUM SPORTS HEATED GRIPS OF692 - ORIGINAL OXFORD !! NEW !! OXFORD HOT GRIPS PREMIUM TOURING HEATED GRIPS OF691 - BEST PRICE !!!!!!!!!!! 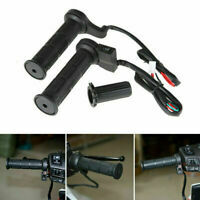 HOT GRIPS PREMIUM ADVENTURE HEATED GRIPS OF690 SWITCH - OXFORD !!!! For warm hands on the coldest of days there's the Heated Motorcycle Handlebar by Oxford. Created to fit snugly on most types of bikes, these handlebars can also be cut to size if needed. The internal premature control gives a nice flow of heat and does not need to be turned on again when you stop at lights. The handlebar structure has been ergonomically designed for better riding performance. Excellent and simple installation. I used to have to older Sports heated grips. Although great I was constantly worrying if I turned them off or not when parked up. Well no more worrying with these new ones. The smart controller recognised when the engine is off and also monitors the battery level. In both cases if they turn off then the grips turn themselves off. I believe the instructions give you 2 minutes before stopping the heat and waiting on standby for a further 5 minutes then turn completely off. In simple terms no finding switch lives, messing about with your wiring loom etc. Just fit and play. One thing to note for first time users make sure your throttle grip snaps back to the off position quickly as this would be an MOT failure. Test the handles left to right making sure the wire doesn't catch and throttle closes quickly before applying any glue. I've used the super glue before in the past and although it does work I've found Evostick red glue is great. Gives you more time before setting allowing a finer adjustment when fitted. Although takes a good 24hrs to set. Just my personal preference. As for the Oxford product you can't go wrong and the price is great, I paid a lot more a couple of years back. Bracket with fittings provided and control unit now screws to the bracket so no pad losing its stick after 6 months. These grips are great, top quality and very easy to fit. The new controller shuts itself off if you forget to turn the grips off after your ride, so there is no need to fit a relay or hack the wiring loom. Top setting on the heat output is more than hot enough, even with thick winter gloves, I generally turn them down after a couple of miles even when it is just above freezing outside. Fitted these to an MT-07. I put a set of these on the last bike I had, and I was so impressed that I put them on my current bike too. I managed to commute through a full Scottish winter wearing only Summer gloves. They work so well that turning them up full was too hot, like holding a hot cup of tea! I would recommend these to anyone who rides all year round. I didn't think I would need heated grips but after trying them I wouldn't be without them! They're fairly easy to fit and great quality. 10 out of 10!